When you think of horse racing. The image that instantly springs to mind is wealthy couples throwing their money around and drinking expensive champagne. Men in deerstalkers or designer suits, women in the latest line from Paris, fascinators balanced at precarious angles on their heads. But the races have changed. Racecourse owners have realised that the best way to get people through the gates is to diversify and make race days more of a family day out. This is certainly the case at Brisbane's two racecourses, Doomben and Eagle Farm. Both run special days where the focus is as much on having fun as having a flutter. Of particular note is their Family Days where activities such as face painting and even a petting zoo keep the kids entertained. There is also Girls Day Out. A chance for the females to get dressed up and have a great day out with a special area reserved for them with competitions and prizes on offer. However, it is the races themselves that are the main draw. So here is a beginner's guide on how to enjoy the day to it's fullest potential. Your first step should be to buy a race programme. This will give you all the information you need to get started including race times, a list of runners and their colours, their form and early odds. Whilst it may seem a little confusing at first, the programme will have a section at the start to tell you what all those lists of numbers mean. Before each race, head down to the parade ring. Here you can see each horse before you gamble your heard earned wages on them. Be warned, looks can be deceiving! Next step is to place your bet. There are numerous tote windows and independent bookies around the course willing to take your money. Don't be fazed by the act of betting. Simply pick a horse that you have a feeling for, whether that be through it's form, it's colours or simply because it's name sounds a bit like the title of that song was playing that night you met your partner. Once you have your choice there are two main betting options, a straight bet or each-way. A straight "to win" bet means that you would collect winnings if your horse wins but lose out if it places anywhere else. Each-way means you pay double your stake and get a portion of the winnings if your horse finishes 2nd, 3rd or even 4th depending on how many horses are running. For watching the races themselves there are three main options. To get the best view of the overall race, head to the stands. Here you will get a panoramic view of the entire track, albeit from a distance. There are screens and a commentary to help you keep up with your horse's chances. To get a more intimate experience, head down to the trackside. Whilst it is more difficult to see the entire race you can see the horses rush by and puts you in the heart of the excitement, particularly if it is a tight finish. The final option is to watch the race on television in the bar. Whilst you miss most of the thrill, at least you can buy a drink and keep an eye on races taking place around the country on the other screens. Next it's off to collect your winnings because you're a natural. Either that or you've had a massive dose of beginners luck. 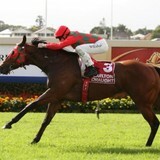 Races meetings are shared between Doomben and Eagle Farm racecourses alternating each weekend. Midweek meetings are free whilst Saturdays cost $15.